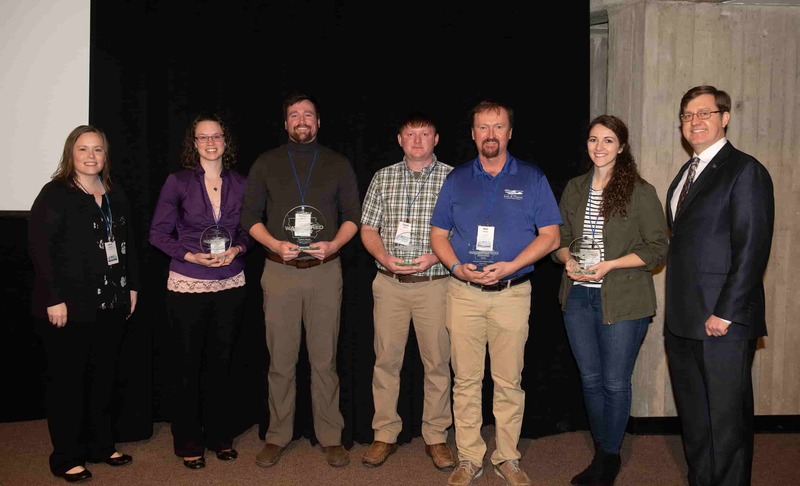 The Iowa Agriculture Water Alliance (IAWA) Iowa Watershed Awards were presented on March 12 at the 2019 Iowa Water Conference in Ames, Iowa. Congratulations to this year's recipients! IAWA developed the Iowa Watershed Awards program with Iowa State University (ISU) Extension and Outreach, Conservation Districts of Iowa, the Iowa Department of Agriculture and Land Stewardship (IDALS), and the Iowa Department of Natural Resources. Colton Meyer, watershed coordinator for the West Branch of the Floyd River Water Quality Initiative (WQI), was named the 2019 Iowa Watershed Coordinator of the Year. Each Iowa Watershed Award recipient was recognized for their unique and steadfast efforts to work with many diverse partners in an inclusive watershed approach that best fits the landscape of each local area. The recipients will receive funding for their local watershed program and for their own professional development. You can read Meyer's full press release here. Bolstering outreach efforts and strengthening partnerships has led to success in Meyer's watershed. You can read Ogle's full press release here. “The project’s stakeholders are supportive and want to see us succeed,” says Ogle. In fact, the county commissioners have a slogan, ‘Farm the best, Regenerate the rest’ which she tries to instill in her work with producers. Ogle explains this means refocusing marginal acres that are currently in row crop production. “One of the main goals is to seed down side hills to help prevent erosion and improve soil and water quality,” she says. Partnering with EFC Systems, the WQI uses the company’s web-based Profit Zone Manager (PZM) to visually compare scenarios on fields to determine which practices, rotations, or land management changes will maximize return on investment for farmers and landowners. This has proven to be a success for Ogle and the Taylor County WQI Project with 100 producers participating in evaluating long-term land use on more than 1,500 acres. You can read Perreault's full press release here. This project's committed partners have invested $3 million in watershed improvements and $9 million in lake restoration. Conservation practices installed in the watershed include soil quality restoration by homeowners, rain barrels, rain gardens, permeable pavement, native landscaping, bio-retention cells, and a stormwater wetland. In addition, 80 acres of woodland has been restored and 4,800 feet of stream has been stabilized with another 9,000 linear feet going out to bid later this year. Multiple detention basins for drainage from 1,390 acres are also planned for restoration 2019-2020. You can read Shaffer's full press release here. Water in the Silver Creek Watershed has improved enough that some landowners have reintroduced native brook trout in their streams. You can read Waters' full press release here. No-till, strip-till, and cover crops are some of the practices producers are using to reduce soil erosion and improve soil health on their farms. Waters sees landowner support and involvement mainly through the implementation of terraces, waterways, ponds, and septic upgrades. Lake Geode is one of the first projects in the state to offer cost-share to update failing septics.